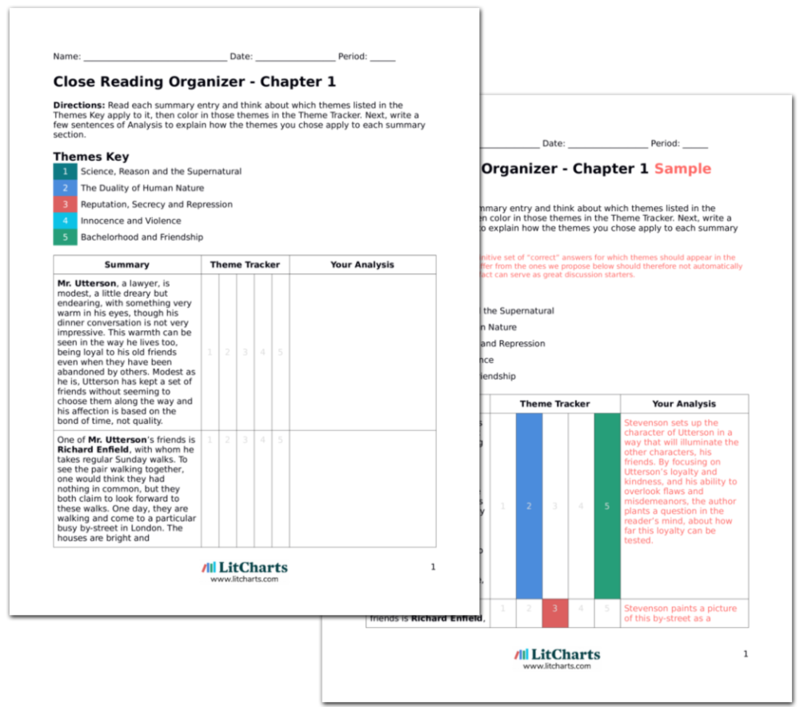 LitCharts assigns a color and icon to each theme in Dr. Jekyll and Mr. Hyde, which you can use to track the themes throughout the work. Mr. Utterson returns to his house, in a somber mood. It is his usual routine on a Sunday to read until late but tonight he goes to his private safe and finds the will that has been entrusted to him by a Dr. Jekyll. The will bequeaths Dr. Jekyll’s estate to Edward Hyde and also notes that should Dr. Jekyll disappear for any reason for longer than three months, Mr. Hyde should also take over his fortune. Not only is this will worrying in principal, it also contains some ominous language that points us to the eventual split personality that is hidden under the surface, phrases that direct Hyde to “step into Dr. Jekyll’s shoes” forebode the fact that this is exactly what Hyde is actually going to do. This document has always angered Mr. Utterson. At first it was because he didn’t know Mr. Hyde, and didn’t know why this man should be placed so high above Dr. Jekyll’s own family, but now, his anger comes from his knowledge of the “detestable” man. He had thought this bequest showed madness on Dr. Jekyll’s part but now he thinks it shows disgrace. Utterson tries his best to professionally explain the cause of Jekyll’s will, and must change his theory as new details emerge. But his insistence on rationally explaining Jekyll’s disgrace seems not to fit with the unexplainable evil aura of Mr. Hyde. Mr. Utterson goes to visit his friend Dr. Lanyon, whose house is always crowded with eager patients. The butler brings Mr. Utterson straight to the doctor, who is sitting, ruddy and energetic, in his dining room. He is an old school friend of Mr. Utterson’s and greets him warmly. Mr. Utterson gets to the point of Dr. Jekyll and asks if he and Jekyll not Dr. Lanyon’s two oldest friends. Dr. Lanyon agrees that they are but says that his own friendship with Dr. Jekyll has soured. According to him, Dr. Jekyll has become devilish and unscientific. A symbolic contrast is made of the story’s two doctors, as two sides of the scientific coin. Here Lanyon’s ruddy complexion and visible popularity with the public shows him as a traditional man of medicine. Jekyll on the other hand, though introduced as a professorial man, has strayed off the professional path according to Lanyon. Rumors give him an air of mystery as well. Mr. Utterson is glad of this explanation from Dr. Lanyon because he thinks that his dispute with Dr. Jekyll is based on a difference of medical opinion, but when Utterson hears that Dr. Lanyon has never heard of Edward Hyde, his restlessness returns. That night he can’t sleep. The nearby clock strikes six and he finds himself replaying Mr. Enfield’s story in vivid pictures in his mind. Then he imagines Dr. Jekyll in bed in his rich house and the figure of Mr. Hyde approaching and blackmailing him in the night. The arrival of Mr. Utterson’s night terrors is a sign of his inability to cope with what he is hearing on a conscious level. The violence of Hyde’s attack and Jekyll’s mysterious burden form a pair of nightmares, replaying and replaying in an alternating slide show. But Utterson, with his rationality, cannot find the link between the two. 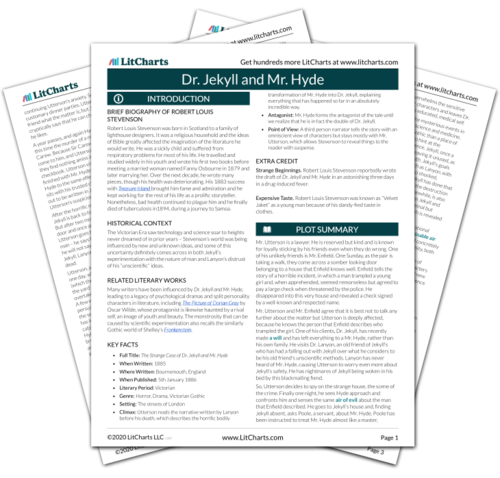 Get the entire Dr. Jekyll and Mr. Hyde LitChart as a printable PDF. As Utterson sleeps, the images become more repetitive and nightmarish but he can never make out Mr. Hyde’s face. He becomes obsessed with knowing what Mr. Hyde looks like. He thinks it might explain how Dr. Jekyll has been so influenced by the man. The next day, Utterson starts to hang about the stoop of the bleak-looking house in the hope of spying the mysterious figure. At last, on a frosty night, when the street is silent and sounds are sharply magnified, Utterson hears someone approaching. The sensations that Mr. Hyde inspires, like hatred and repulsion, are very strong. But he is never really described—his deformity is somehow entirely intangible. He is identifiable by this intangible quality. It is what sets him apart. This gives him an air of inhumanity that connects him with Lanyon’s idea of the “unscientific”. The steps draw nearer until Mr. Utterson sees the plain figure of the man in question and quickly surprises him at the door, addressing him. Mr. Hyde is afraid for a moment but answers to the name. Mr. Utterson introduces himself as a friend of Dr. Jekyll’s but Mr. Hyde tells him that Dr. Jekyll is not inside. Utterson asks to see Mr. Hyde’s face and Mr. Hyde obliges, after a brief hesitation, and agrees that it is good that they have made each other’s acquaintance, as if Hyde has also been thinking about Jekyll’s affairs. He gives Utterson his address in the neighborhood of Soho. Mr. Hyde’s strange contradictory personality, both grotesque and polite, is surprising. But what is perhaps more worrying is how willing and unashamed he is. He is not like a criminal on the run at all and doesn’t shrink much from Utterson’s questioning, and in fact reveals the details of his residence. Mr. Utterson explains to Mr. Hyde that they have mutual friends, naming Dr. Jekyll as one of them. Mr. Hyde becomes suddenly defensive and tries to cover up the snarl that forms on his face. He rushes inside and Mr. Utterson is left to make his way through the dark street and ponder the inexplicable grotesqueness of the man. There is something deformed, even monstrous, about Hyde, but Utterson cannot place what detail gives him that impression. The infamous, inexplicable deformity of Mr. Hyde now becomes connected with Dr. Jekyll. The mention of the doctor’s name seems to produce a visible change in the man, a kind of animal reaction, like an angry dog. Who controls who between the doctor and this criminal is unclear at this point. Mr. Utterson walks to a house around the corner, in a square of elegant but old properties, and asks its servant if Dr. Jekyll is at home. He recalls that this hallway in Jekyll's house was once his favorite room in the city, but that now with its flickering light and strange shadows, it seems fearful, and he is glad when the servant returns to say that Dr. Jekyll has gone out. Jekyll’s character is symbolized by this elegant property and the hearty hospitality of a fire, so the subtle change in this atmosphere to an ominous one suggests that Jekyll himself is somehow unstable or unsafe. Mr. Utterson asks the servant if it is all right that he has seen Mr. Hyde going into the “old dissecting room” and the servant replies that Mr. Hyde has a key and that the servants have been instructed to always obey him. Mr. Utterson goes home, having come to the conclusion that Dr. Jekyll has been condemned by some past fault and is now bound to obey Hyde by some debt. This turn of events puts Mr. Hyde in a position of power and status as if he were an equal of Dr. Jekyll – for Poole, it is as if he has two masters. The bond of Jekyll to Hyde is closer and more powerful than it once seemed. This makes Utterson think of his own past. He, of all people, has little cause to worry about sinfulness, but now he thinks of every moral wrong he has ever done or avoided. He is sure that Mr. Hyde has heinous deeds in his past, and Utterson resolves to protect Dr. Jekyll. He knows he must act quickly, because if Mr. Hyde has found out about the will, he is sure to aim to inherit the estate soon. This is one of the only occasions that we are given a glimpse into Utterson’s more personal reflections, revealing that despite his even-keeled nature and hyper-rationality even Utterson is not purely good. Note how Utterson continues to think that the connection between Jekyll and Hyde must somehow make rational sense. Parfitt, Georgina. "Dr. Jekyll and Mr. Hyde Chapter 2." LitCharts. LitCharts LLC, 26 Oct 2013. Web. 24 Apr 2019. Parfitt, Georgina. "Dr. Jekyll and Mr. Hyde Chapter 2." LitCharts LLC, October 26, 2013. 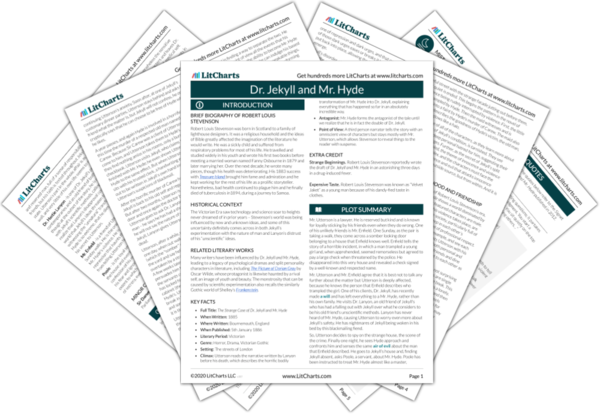 Retrieved April 24, 2019. https://www.litcharts.com/lit/dr-jekyll-and-mr-hyde/chapter-2.